We all have witnessed during our life time the large destructive Tidal Waves which are known today as the Tsunami (a Japanese Language word meaning "Harbour Waves") hitting the shores of Tamil Nadu and Sri Lanka, in addition to many other South and South-East Asian Countries on the 26th December 2004. The "Tidal Waves" (Tsunami) are a series of destructive sea waves that moves across the ocean, generated by large and violent Earthquakes (i.e. Vibrations or Tremors) occuring beneath the sea. These Earthquakes are due to sudden dislocation of the segments of the earth's crust, resulting from the under sea volcanic eruptions (i.e.molten rocks eruptions). The "Under-Sea Landslides" (Submarine Avalanche) are falling or sliding of large masses of the mixture of - soil, rock, and other earth materials from outside the surface of the sea, rapidly into the sea under the force of gravity. The seabeds wherever the offshore slopes dip steeply enough pose the threat of "Under-Sea Landslides", and sometimes may not even require Earthquakes to touch them off. They are capable of generating deadly Tsunamis as the surface of the ocean first recedes and then surges forward to crash against the shores. From the earliest Tamil literary works belonging to the first and second century Tamil Nadu, namely Iraiyanaar Ahapporul, Kaliththohai, Silappathikaaram, and Manimehalai, we come to know that in the ancient times too there had been massive Tidal Waves which have hit the shores of the Paandiya (Pandiya) country and the Chola country of the then Tamil Nadu of South India, causing very big damages and heavy losses. At times there have been very ferrocious Tidal Waves that have hit Tamil Nadu, and large areas of the seaside lands and the lands much interior have submerged into the ocean, possibly due to big "Under-Sea Land Slides". The Paandiya Country of the then Tamil Nadu of South India, had it's capital city in the inland known as the "Adakak Kudumi Maadak Koodal" which means: the Koodal (city) with buildings having golden spires. Mathurai was the other name of this city of Koodal. It was at this Koodal (or Mathurai) city of the Paandiya country, the first Tamil Sangam (a Tamil Academy) with many Tamil Poets fostering the growth and development of the Tamil Language & Literature under the patronage of the Paandiya kings, was instituted and conducted for many years. which means: ".....in front of the Koodal with golden spires on the palahai (seat) of the Sangam office, the world famed poet with sweet compositions the sage Mudinaganithi of the Muranji centre......"
"........in the Uli the Agathiyaaar and Muranjiyoor Mudinagaraayarum......."
Silappathikaram - Page 7-8 (U.V.Saminatha Iyer's Edition). Poem found in an old Ola Leaf Manuscript in the house of Sevvur Sittrampalak Kavirayer included in this edition. It was during the first Tamil Sangam period the ferrocious Tidal Waves of the Sea of a very great magnitude, have hit and destroyed the coastel and far inland areas of the Paandiya country, most possibly due to a very massive Under-Sea Land Slide which sank a very large land mass with many countries, range of mountains, rivers, and forests far south of the present Kumari region (in the south) which all went under sea. "......Ak kaalaththu ‘avar naattuth’ Thenpaali mukaththitkku vada ellaiyahiya Pahtruli ennum aartritkum Kumari ennum aartritkum idaiye elunoortru kaavatha vaarum ivattrin neer malivaanena malintha Earl Thenga naadum, Earl Mathurai naadum, Earl Munpaalai Naadum, Earl Pinpaalai Nadum, Earl Kuntra Naadum, Earl Kuna Kaarai Naadum, Earl Kurumpanai Naadum ennum naatpaththu onpathu naadum, Kumari Kollam muthaliya panmalai naadum, kaadum, nathiyum, pathiyum, thadaneer Kumari Vadaperum Kottin ‘karum kadal kondolithalat’ Kumariyahiya Pauvam entru unarha....."
which means: "....In those days between the Thenpaalimukam (southern “seawater” front) of his (Pandiyan's) country, and the northern boundry being the Pahtruli river and the Kumari river, there had been 700 hundred Kaavatham distance and in between which there were forty nine countries, (named) the Earl(seven) ThengaNadu, Earl(seven) Mathurai Nadu, Earl(seven) Munpaalai Naadu, Earl(seven) Kuntra Nadu, Earl(seven) Kunakaarai Nadu, Earl(seven) Kurumpanai Nadu, the country known as Kumarik Kollam of many mountains, the forests, rivers, cities, upto (but not) the northern big mountain range of Kumarik Kodu - were swallowed by the sea......"
From the above reference it is very clear that there had been a large land mass of about 700 Kavatham distance (1750 miles) covering forty nine countries and a region called Kumari Kollam in between the northen mountain range of this landmass known as Kumarik Kodu and its far southern “seawater” front (Thenpaalimugam), having many mountains, forests, rivers and cities. From same it appears the region just south of Kumarik Kodu was a region called the Kumarik Kollam. In the south of this region have been the Pahruli river, and the Kumari River was close beyond the Pahruli river in it’s south. In the above reference it is confirmed that these two rivers were the northern boundries of the lost large land mass. It also appears the next two regions beyond Kumarik Kollam would have been the Earl Thenganaadu & Earl Mathurai Nadu. It appears the Kumarikkodu mountain range and the Pahtruli river escaped this sea disaster while the Kumari river with the major part of Kumari Kollam and the entire land mass south with forty nine countries went under sea. Among these countries which went under sea was the “Earl Mathurai Nadu” which is undoubtedly the "Then Mathurai" (Southern Mathurai) the capital city of the early Pandiya kings which comprised the first Thamil Sangam of the Pandiya country. This first known Sea destruction cannot be simply estimated as a Tsunami that we have witnessed during our life time. But it appears to be a vast and massive "Under Sea Land Slide - a Submarine Avalanche covering approximately 1750 miles in the southernly direction beyond the the Kumarik Kodu and Pahtruli river gradually sliding into the sea. This is probably the vast landmass the modern Geological Scientists refer to as “Lost Lemuria” or “Kumari Kandam” which was submerged in the sea. It also appears the great land mass beyond present Kanyakumari district was probably embracing the present Sri Lanka too within, and with this massive "Under-Sea Land Slide" in the south of India it was seperated from the remaining Indian Mainland. This could be a definite possibility as “Sivatharumoththaram” says at the foot of the Mahendra mountain was the Illankai thesam and that give us a clue that the Mahendra Mountain range extended beyond the present Kanyakumari region along the west of the present Sri Lanka and the Illangai Thesam was on the east of the Mahendra Mountain range at its foot hills which submerged in to the sea leaving back Sri Lanka. This destruction would have taken place long before the period of the epic story Ramayana. This is confirmed by the reference in the Valmiki Ramayana that the Mahendra mountain range of the then Kumarik Kodu remained almost fully submerged into the sea at the time of Ramayana epic, and only a peak of this range remained on the outside surface during the time of this epic story, and continues to remain even today known as the Mahendragiri (or Mahendra Malai) in the present Kanyakumari district of Tamil Nadu. This is confirmed by the Valmiki Ramayana as follows. Further from the commentery of “Adiyaarkku Nallaar” in Silappathikarem referred above, it is clear the northern most region of this large land mass – the Kumarikkodu range of mountains with Kummarik Kollam and the Pahruli river escaped the wrath of the sea, and from the sequential order of the countries listed above immediately after them, it is clear the Pandiyanadu of that period encompassed the Earl Thenga Nadu and the Earl Mathurai Nadu, from where possibly people would have fled more towards the north to the regions of Kumarik Kollam and the Pahruli river. From the same source another reference confirms the first Pandiyan king of second Thamil Sangam was Vendherch (Venther) Cheliyan. Hence it is clear the last Paandiyan king of the first Thamil Sangam the Kadungkoan did not survive the tidal waves with undersea landslides. "......yuktam Kavaatam Paandyaanaam gataa draksyatha Vaanaraah tatah samudram......"
which means: "...... having reached Kavaatam of Pandiya ongoing you shall see Vaanarah (Oh! 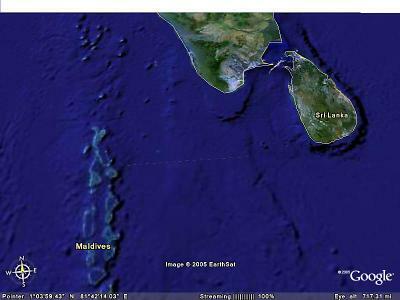 Anuman) then ocean...."
This is further confirmed by the follows. ".......maasil vaan munneer parantha thonnilam aalum kilamaiyodu punarnththa enko vaaliyar im malarthalai ulake......"
Hence the 'wide seafront ancient land' could possibly refer to Kapaadapuram. From the above it is clear the second Pandiyan capital Kapaadapuram was closer to the sea some what east of the present Mathurai. The Pandiyan king with a view of preventing further sea disasters had a festival celeberated for the Sea God and hence he was known as "Munneer Vilavu Nediyon" (Munner Vilavu = Sea (God) celeberation) and also as "Vadivalamba nintra Pandiyan". In this new city of Kapaadapuram the Paandiyan king establised the second Thamil Sangam which is confirmed by the follows. "......Irandaam Uliyathakiya Kapaadapuraththin Idai Sangam......."
".......Idaich Sangam vinnakam paravu methahu keerththik Kannakan parapit Kapaadapuram enba....."
which means: "the middle (second) Sangam at Kapaadapuram the land of Kannakan (the Pandiyan) of great fame spreading to the heaven"
"......mahathuvamudaiya Agaththiya Illakkanam vaduvaru kaatchi naduvat sangath Agaththiyar Tholkaappiyath Thamil Munivar.......an naal Illakkanam Agaththiyam athanodu pinnaat seitha pirangu Tholkaapiam......"
which means: "the Naduvar Sangam where the Agaththiya Illakanam of esteem was (staged), to weed off the faults (there the) Agaththiyar and Thokaapiya Thamil sage"
"........irrandaam Uliyathakiya Kappaadapuraththin idaich Sangaththu Tholkaappiam pulappaduththiya Maakeerthiyaakiya Nilam tharu thiruvit Pandiyan avaikkalaththu Agathiyanaarum, Tholkaappianaarum......"
which means: "the middle (second) Sangam of the Kapaadapuram of second Uli where the Nilam tharu thiruvit Pandiyan who brought forth the Tamil Grammer Work the Tholkaappiam, in his auditorium where the Agathiyanaar and Tholkaappianaar were present"
This further confirms that Tholkaappiam was staged during the time of "Nilan tharu thiruvit Pandiyan"
'.......munneer vilavin Nediyon nalneer Pahtruli manalinum palave......"
Many years after the period of the Ramayana Epic the destructive waves of the sea, again destroyed the Pandiyan capital, on this occasion the Kapaadapuram with the second Thamil Sangam. This too would have been the destructive fierce Tidal Waves resulting again from a big Under-Sea Land Slides, with the destruction of the Paandiya country with the Paandiyan capital Kapaadapuram with the river Pahruli and some adjoing lands along the coastel regions and the Kumari Range of Mountains (Kumarkikodu) went under sea. ".........Pahtruli arttrudan pan Malai adukkaththuk Kumarik Kodum kodung kadal kolla vada thisaik Gangaiyum Imayamum kondu then thisai aanda Thennavan vaali......."
which means: "....long live the Pandiyan [who, when] the Pahtruli river and the many ranges of mountains of the Kumarik Kodu was swallowed up by the fierce sea, captured the the Ganges [river] and the Himalayas of the north and ruled the south"
This is further confirmed by another Sangam period Tamil Literary work Kaliththohai which states as follows. ".....Mali thirai oornthu than mann kadal vowvalin melivintri metsentru mewaar naadu idampadap puliyodu vil neekkip puhal priththa kilar kendai valiyinaal vanakkiya vaadaar seer thenavan....."
It was probably after that the Paandiyans realised the gravity of the natural disasters and built the new capital much interior in the central region of lower South India far away from the sea also known as Mathurai, apparently the present Mathurai where they held the third Thamil Sangam. As this was the new city of the Paandiyas where the third Thamil Sangam was established bearing the same name as the city where the first Thamil Sangam functioned earlier in the lands in the south which have now submerged into the sea, the Mathurai of the third Thamil Sangam was referred to as the Vada Mathurai (Northern Mathurai) during that period. ".....Arung Kadaich Sangam irunthor........puviyit Sangam puhal Vada Mathurai......"
During the period the Pandiyas establised the third Tamil Sangam at the new Mathurai in the central region of southern India, the Cholas had their capital at Kaviripoompattinam also known as Poompuhar. The God Indra was known in Tamil Nadu as the god of ocean during the Ramayana days and the legend holds that God Indra visited on auspiciou days the Kumari region where the Mount Mahendra is situated which is confirmed by the following statement in the Ramayana. which means: "The Thousand-eyed Indra always reaches that Mt. Mahendra on every auspicious day... and the other shore is an island with a breadth of hundred yojana-s"
The Cholas probably realising the gravity of the sea tides from the experiences of the Paandiya Naadu yearly had a great festival for fourteen days worshiping the ocean god Indra as Indra Vilaa at the ocean front where the Kaveri river joined the sea and where they had built their capital city the Kaviripoompatinam. The people of Kavirimpoompattinam believed that if the Indra Villa festival is defaulted that they had to meet the wrath of Bootham hence the festival should be conducted. ".......viduththa bootham vilaakkon marappin madiththa sevvaai val eyiri ilanga Idikuran mulakkaththu thedumbai seithidum thoduththa paasaththu tholpathinarakarai pudaiththunnum porunthathaayidum......."
From the Silappathikarem we note after the tragedy and death of the heroine Kannahi (Paththini) the Chola kings defaulted in conducting the annual seafront festival to God Indira. This resulted in the Kaviripoompattinam also known as Poompuhar having to face the fierce Tidal Waves of the sea which destroyed this seaport city. "......Kavirip Pattinam kadal kolu entru thavaththu urai kettu....."
".......manangkaval keduththathu Manahar kadal kolla Aravanaadikalum Thayarum aangu vittu irrava ipPathi puhunthathu......."
"......Vaanavan vilakkoan maanagar olinthathu Mamimekalatheivam mattrathu poraal anninagar thannai alai kadal kolha ena vittanal saabam patta ithuvat kadavun Managar Kadal kolla peyarntha vadivet thadakkai vaanavan pola virithirai vanthu viyannager vilunga oru thani poyinan ulaka mannavan......"
"Theevaka Santhi Seyya naalun Kaavan Ma nagar Kadal vayiru pukoom Manimekali than vaaimoli yaalathu thaniyaa Indra saabam undaakalin aangu pathiyalithalum eengu pathi keduthalum ventharai yatoi meyena kondik kaasin managar kadal vayiru puhaamal vaasavan vilaa kon maravel"
"Vinnavar Thalaivanai vananki munintru mannaha thentran vaanpathi thannul meloar vilaiya vilakkol eduththa naal earl naalilum nankinithuraikkena amarar thalaivan aangathu nernthathu"
Last edited by virarajendra; 1st May 2018 at 02:46 PM. A severe Tsunami followed by an Earth Quake has hit the North-East Japan today morning (11-2-2011). This article is brought forward to give the Readers an idea on what a Tsunami is, and a study on the Tsunamis that hit Tamil Nadu in ancient times. Last edited by virarajendra; 11th March 2011 at 02:21 PM. Thanks a lot for your informative posts. A Very big land mass going under the sea must have happened very very long ago during the ages of evolution of the human species or before that. These ancient texts gives a different idea that it could have happened some centuries around the first Tamil Sangam era. So when did the first Tamil sangam era happen? The exact or approximate period of First Thamil Sangam is still to be determined. However the text Sivatharumoththiram states that the region of Sri Lanka existed on the east and at the foot of the Mahendra malai. With the first great Tsunami it is said Mahenthramalai and lands adjoing same submerged into the sea, and Sri Lanka was seperated and remained an Island. We are also aware from Adiyarkku Nallaar's urai to Silapathikaram that during the period of second Thamil Sangam Kavadapuram was the capital of Pandiya Nadu. The Second Thamil Sangam period is approximately determined as during the period of Valmiki Ramayana. Sugrivan advices Aanjaneyan to search for Seetha also at Kavadapuram (capital) of Pandiya Nadu. From the above refrence it is evident that Sri Lanka being seperated as an Island took place long before the period of Valmiki Ramaayana. The second Tsunami in which the Pandiya capital Kavadapuram submerged with vast lands is further confirmed by the reference in Silappathikarem as ".........Pahtruli arttrudan pan Malai adukkaththuk Kumarik Kodum kodung kadal kolla...."
i.e. Land mass covered by the length of Pahtruli river along with Kumari mountain (Kumarik Kodu) having range of many hills (pan mlai adukkaththu) submerged in to the fierce sea. Trust the information provided to you on same are of interest to you. Last edited by virarajendra; 12th April 2012 at 08:12 AM. Very true! About Tidal Waves seperated SL from the southern tip of India ! If I am correct this must have happened before "Satya Yuga" as Lanka is mentioned in Ramayana, which was supposed to have happened during this time period. Last edited by PARAMASHIVAN; 21st September 2012 at 04:23 PM. 'குமரிக்கண்டம்' என்றும் 'லெமூரியா' என்றும் தமிழர்களால் அறியப்பட்டிருக்கும் - தமிழர்களின் தொன்மையான தாயகம்இன்றைய கன்னியாகுமரியின் தெற்கே கடலில் அமிழ்ந்து கிடக்கிறது என்கிற செய்திக்குப் பல சான்றுகள் கிடைத்த வண்ணம் உள்ளன. satellite imagery-ல் இந்தியப் பெருங்கடலுக்கு அடியில் அமிழ்ந்து கிடக்கும் நிலப்பரப்பு கூரிந்து கவனிக்கும் போது , இந்தியத் தென்பகுதி எல்லையை ஒட்டி ஒரு Continental shelf-போல் அல்லாது , தொடர்ச்சியாக ஒரு நிலப்பரப்பு போன்று அந்தப் பகுதி தோன்றுகிறது. குமரித் தென் எல்லையில் இருந்து கடலுக்கு அடியில் சுமார் ஒரு 300 கி.மீ தொலைவு தூரத்துக்கு அந்த நிலப்பரப்பு க்டலினடியில் தெரிவதைக் காண முடிகிறது. என்னதான் 'லெமூரியா' ஒரு கற்பனைக் கதை என்று சில தொல்லியல் அறிஞர்கள் ஜல்லியடித்தாலும் - நம்முடைய பண்டைய இலக்கியச் சான்றுகளும், மொழியியல் ஆய்வுகளும், தற்போதைய குமரிக்குத் தெற்கே இருந்த பெரும் பண்டைய தமிழ் நிலப்பரப்பு - கடற்கோளில் அமிழந்து போனதை பல இடங்களில் தெரிவிப்பதை ஒதுக்கித் தள்ளுவது கடினம். கூகிள் எர்த் மென்பொருள் மூலமாக சில புதிய தொல்லியல் ஆய்வு இடங்களைக் கண்டுபிடிக்கப்பட்டுள்ளதாகத் தெரிகிறது. கமபோடியக் காடுகளின் அடர்ந்த இருளுக்குள் மறைந்து கிடந்த - ஒரு தொலைந்து போன பண்டைய நகரத்தையே - விண்வெளியிலிருந்து செயற்கைக்கோள் துணையோடு, அகச் சிவப்புக் கதிர்களின் ஒளிவீச்சு மூலம் புகைப்படமெடுத்து - முழுவதுமாகக் கண்டறிந்து வெளியிட்டதையும் - பின்னர் அகழவாய்வு வல்லுனர்கள் அந்த இடத்தை எளிதாக ஆராய்ந்து வெளிக்கொணர்ந்தததையும் - தொலைக்காட்சி செய்திகளாக வருகின்றன. அதே போன்று - பல்லாயிரம் வருடத்துக்கு முந்தைய காலத்தில், 'பெரு' நாட்டில் வாழந்திருந்த ( இன்கா நாகரீக காலத்துக்கு முந்தைய) பண்டைய மக்களின் நகரங்களை அங்கிருக்கும் ஒரு தொன்மை வாய்ந்த ஏரியான டிட்டிகாகா(Lake Titicaca) அடியிலிருந்து அகழ்வாய்வு நிபுணர்கள் கண்டு பிடித்ததையும் படிக்க நேர்ந்தது. 'அய்மாரா', 'ஊரு' (கவனியுங்கள்!!) - என்பன போன்ற பெயர்கள் கொண்ட ஆதிப் பழங்குடிகள் இன்றும் அந்த ஏரிக்கரையில் வசித்து வருகிறார்கள். இதிலே வியப்பான விசயம் என்னவென்றால் அந்தப் பழங்குடிகள் - 'லெமூரியாவில்' ஏற்பட்ட 'ஊழி வெள்ள்ப் பெருக்கிலிருந்து' தப்பி வந்த பழங்குடிகளின் புதல்வர்கள் என்று நம்பப்படுவதுதான்! Last edited by geno; 20th September 2012 at 11:15 PM. There was a book on Kumarikkandam - Kumari Nila Neetchi (குமரி நில நீட்சி) by Su.Ki.Jayakaran that traces the history of the debate. Talks about the history of the development of this point of view, the literary references and also oceanographic studies and concludes against the existence of KumarikaNdam. I found it quite convincing. He goes to say, there was indeed a loss of lands - most notably the land connecting today's INdia and SL- as recorded in the poems that caused widespread destruction and migration. But the geographical extent has been overstated - there was one 'map' in the early 20th century that charted KumarikaNdam all the way to Australia! Last edited by P_R; 21st September 2012 at 02:55 PM. Hi SS, the dates go back to 10,000 years or more in the past. Check virajendra's first post that mentions the several literary references for kumarikandam, particularly the reference to the sinking of a mahendra malai south of Lanka. Jayakaran contends the submersion of the land (of several hundred miles) including the strip connecting India and SL, may have happened within the 10,000 years. And that is what is possibly being recalled as Kumarikandam by the poets. btw his interpretations have also been criticized by people like Kumari maindhan, who maintain that there was no exaggeration and that the submerged land was indeed huge and stretched from Madagascar to Australia, had a flourishing mature civilization. The WaVes - Tamil Tragedy?